This idiom doesn't actually mean that you should stick your fingers in your mouth and grab a hold of your tongue. It means that you shouldn't talk. People "hold their tongues" when they're in situations where they want to talk, but it would be better if they didn't. So, while their tongue is ready to do some talking, they "hold" it and don't say anything. 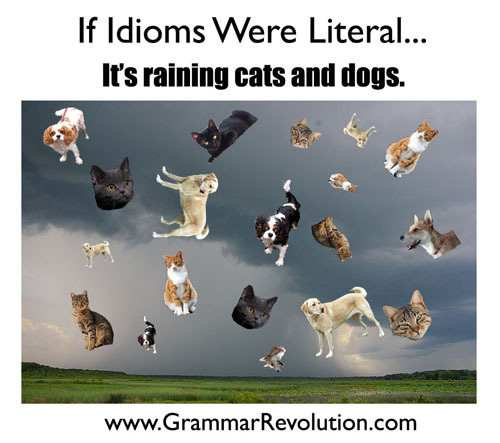 Scroll down to see a list of twenty common idioms and their meanings. 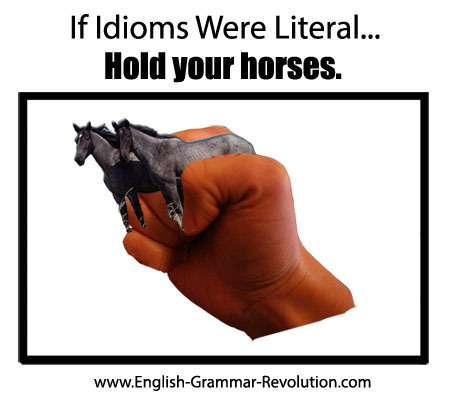 Every language has idioms, and they can be difficult to learn if you're not a native speaker of that language. If English isn't your native language, the best thing that you can do is have conversations with native speakers and ask them about phrases that you don't understand. Since idioms are influenced by the culture, learning the idioms of a language can be very interesting and enlightening! 2. You are hands down the best player on the team. ---> There was no competition. 6. Rise and shine! ---> Wake up and be happy! 7. Close, but no cigar. ---> You were very close, but you did not make it. 13. Yikes! This shirt costs an arm and a leg. ---> It is extremely expensive. 15. It's Greek to me. ---> I don't understand. 16. Keep your chin up. ---> Be happy. 17. Hold your horses. ---> Be patient. 18. We're all in the same boat. ---> All of us are in the same position. I think your material is great. I am so thankful I found it.